All last week, trucks rumbled into Raymore Park delivering old bricks and concrete blocks (clean fill). I braved the bitter cold this afternoon to find out what was going on. Rather than building a stable roadway along which trucks can approach the river, the whole of the fenced off land is being laid with about 40cm of clean fill to create a working area that stretches to the river’s edge from which the retaining wall can be constructed. Topsoil scraped from the area can be seen (right) and brick rubble ready to be spread over the remainder of the land is on the left. To get an idea of the scale of this endeavour, there’s a person standing by the orange fencing (far left). The depth and size of the rubble layer can also be seen here. Apparently the plan is for the rubble to be carted away again and the topsoil replaced after the job is completed. A closer look at the brick rubble and (eventually) the old topsoil waiting to be spread over the park surface. One permanent change that may have been made; the old basement depressions from homes swept away during Hurricane Hazel are probably gone. 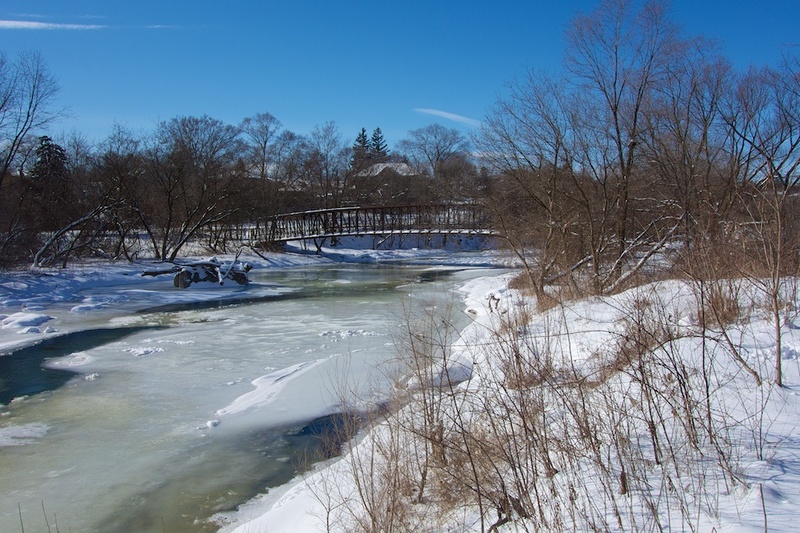 This entry was posted in Humber River, Hurricane Hazel, Park management, Photography, Raymore Park, TRCA and tagged Humber River, Hurricane Hazel, Raymore Park, TRCA, winter on 2016/02/14 by Roy Murray. Work begins on Humber bank stabilization and sewer rehabilitation. More than a decade ago, the owner of a house on Sykes Avenue in Weston suddenly lost several feet off the back end of their property. The house overlooks a sharp curve of the Humber River as it turns to the south. During April rains in 2004, the rear of the property abruptly vanished along with several mature trees and other vegetation. Luckily nobody was standing near the edge. Shortly after the landslide in April 2004. A panorama view of the bank as it looks today. Note the current retaining wall and the precarious position of the tree on the right. That summer, the fallen trees actually went into leaf and remained in place for most of the season but were eventually washed down the Humber. What caused the erosion? Who knows; it probably didn’t help that each autumn, the owner at the time drained the pool over the top and into the river. The likely explanation is that the slope was simply too steep to withstand the shearing forces and nature adjusted the angle. TRCA is responsible for erosion control and has a handy guide for those ‘living on the edge’. It must have been painful to update the property deeds to reflect the new reality. After this event, the owner put in some vegetation and other stabilization measures but by then the rot had started and moved downstream taking chunks of other back yards into the river. A retaining wall of sorts is already in place, built in 1981 and it has been high enough to provide ‘toe protection’ for most flood events. Unfortunately it wasn’t tall enough to cope with major events such as the storm of July 2013. After extensive study, TRCA has decided that in order to stabilize this stretch of the Humber, a 6.5 metre tall ‘replacement armourstone wall’ and stabilization measures need to be put in place on 170 metres of the east bank before more land disappears downstream. Raymore Park entrance. Notice that the pathway and direct footbridge access is blocked to pedestrians. This could have been avoided by fencing off a narrow gap on the left. Looking south from the parking lot. The trail resumes further down. Since construction from the top of the east side is impossible, the plan is to access the wall through Raymore Park. Unfortunately the solid winter ground from the bike path to the river expected by the construction crew has failed to materialize (so far) and a steady stream of trucks has been offloading fill onto the site in order to construct a stable road down to the river. Sadly dozens of native trees that were planted several years ago have been removed from a surprisingly large area. Presumably these will be replaced but this will delay the expected native canopy planned for this section of the park. The new road under construction leading to the river. Notice the clearance of all trees and shrubs. Another view showing the extent of the clearance. In the meantime, pedestrians are having a messy time getting access to the footbridge from Raymore Drive, the continuation of the path further down the park and there are questions regarding the replacement of trees and shrubs lost when the land was cleared. According to the leaflet delivered to homes in the area, the work is scheduled to be completed by the end of March and restoration of the land will take place in the fall. Projected cost: up to a maximum of $250,000. At the same time, more sewer rehabilitation work is ongoing along the Humber that will necessitate further tree clearance along the path of the sewer line between now and the end of March and this will extend along the river between Raymore Drive to well past Eglinton. The City of Toronto has more information here. Later this spring will begin the construction (if given final approval) of the proposed leash free zone (Many dog owners seem to have declared Raymore Park leash free already). This will bring even more heavy equipment through the park. A final meeting is scheduled for February 25th at 6:30pm in Westmount Junior School, 95 Chapman Rd. Councillor Rob Ford will be in attendance. This entry was posted in Humber River, Hurricane Hazel, Park management, Raymore Park, TRCA, Trees and tagged erosion, Hurricane Hazel, native trees, Top of Slope, TRCA on 2016/02/07 by Roy Murray. Weston Historical Society’s Cherri Hurst (far right) talks at the first stop on the tour. 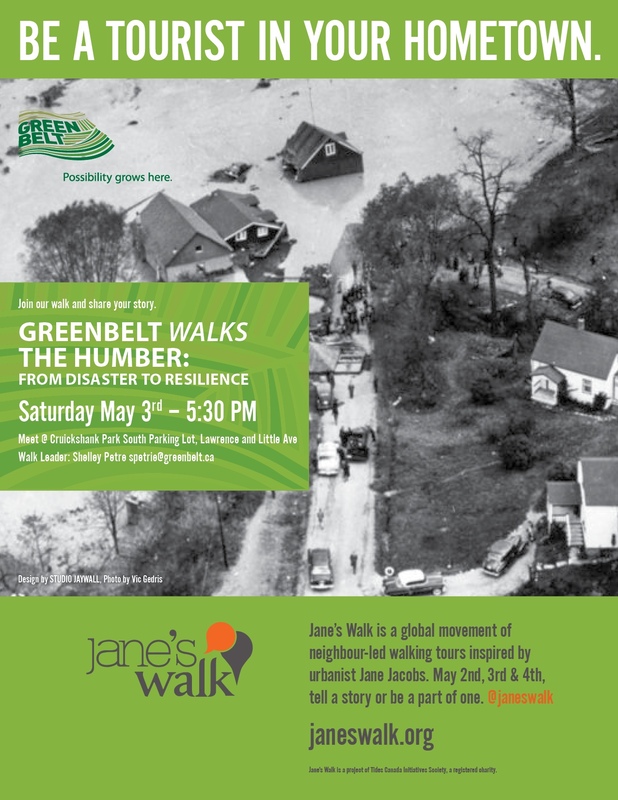 Close to 70 people attended last Saturday’s Hurricane Hazel Revisited walk. The guided tour stopped at many of the significant locations that played a part in the October 1954 tragedy that changed the face of Toronto. The walk was well received thanks to an excellent script that was a collaboration between Weston Historical Society members, Cherri Hurst and Mary-Louise Ashbourne. 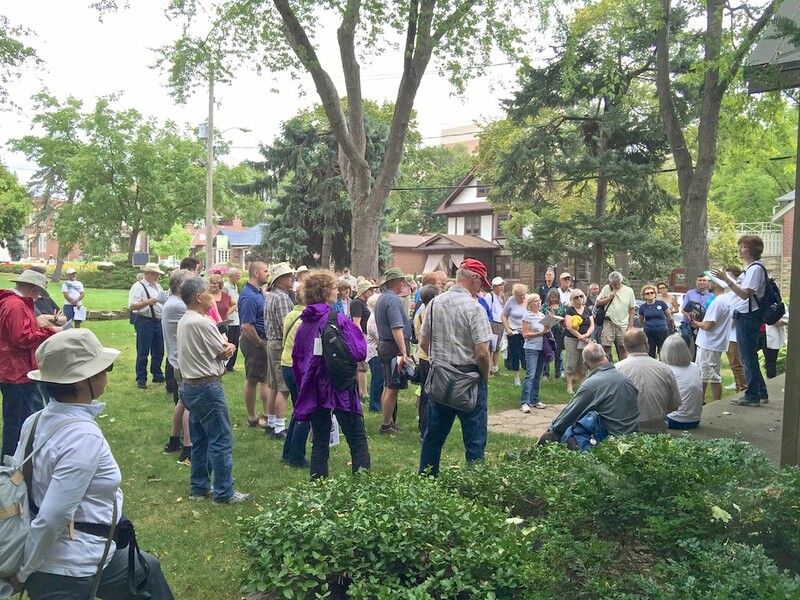 I had the privilege of assisting in this Heritage Toronto walk and the level of interest among attendees was impressive. Hazel’s legacy is our precious park ravine and system; a place to enjoy nature as well as a haven for plant and animal wildlife. Thanks to Jill for coming all the way from Burlington and adding a personal touch via her father’s incredible memories of being personally involved during the storm. The rain held off until we began walking to the renovated St Matthias Church – now the Canadian headquarters for Sukyo Mahikari. We were shoehorned into the beautifully restored small church, dripping wet and were given a bonus presentation on the renovation of the church which played a part during Hazel’s aftermath. This entry was posted in Hurricane Hazel, Raymore Park and tagged Cherri Hurst, Heritage Toronto, Hurricane Hazel, Raymor Park, Weston Historical Society on 2015/09/23 by Roy Murray. A knock on a door sealed the fate of two families on the rainy night of October 15, 1954. They lived on Raymore Drive in an idyllic neighbourhood by the shore of the Humber River. That night, radio stations had warned of a dangerous hurricane making its way north that would dump more heavy rain onto an already saturated ground. Autumn in Ontario is a time of transition. The province occasionally finds itself in the path of extra-tropical hurricanes that are usually shadows of their former selves by the time their energy supply of tropical air has been cut off. This hurricane, named Hazel, was different. It had wreaked havoc in many areas of the United States. Instead of becoming a rain event, Hazel managed to re-energize itself by finding and merging with a cold low pressure area and using that to squeeze out more wind and moisture. As the evening progressed, the storm parked itself over the city and the already swollen Humber River began to rise higher than residents had ever seen it. In wintertime, ice jams would bring water and inconvenience to the doorsteps of a few homes at the lower end of Raymore Drive but this time was different as the higher water level ceased to be an annoyance and started to become a threat. The roaring water surged wildly with no sign of levelling off. As water lapped over thresholds into homes near by the river, one family thought it wise to ask neighbours on higher ground if they could bring over furniture threatened by the rising waters. This was the fatal knock. While the two families focussed on moving furniture to the higher house, their single-minded dedication to the task may have prevented them from acting quickly when events took a sudden turn for the worse. What neither family could see and what would end up costing the lives of 35 residents of the neighbourhood was an unpredictable turn of events. Straddling the river hung a suspension footbridge. It was then, as its replacement is today, a convenient short cut from Raymore Drive to the bustling town of Weston, a centre of commerce for miles around. It was known as the swing bridge, not because of any mechanical abilities but like any suspension bridge, it could be coaxed into swinging by rhythmic walking or jumping. As the water continued to rise, the western abutment of the footbridge was dragged off its perch into the river a few metres downstream where it anchored itself in the position it occupies today. The cables of the bridge held and in effect, re-positioned the bridge diagonally across the river forming a barrier which, thanks to the debris washing downstream quickly became a diversionary dam. Suddenly and without warning, the river was steered directly into the path of the homes at the end of Raymore Drive engulfing our two families and taking a total of 35 lives at this location. Today, the western abutment is still resting in the river, standing as a grim witness to that terrible night. 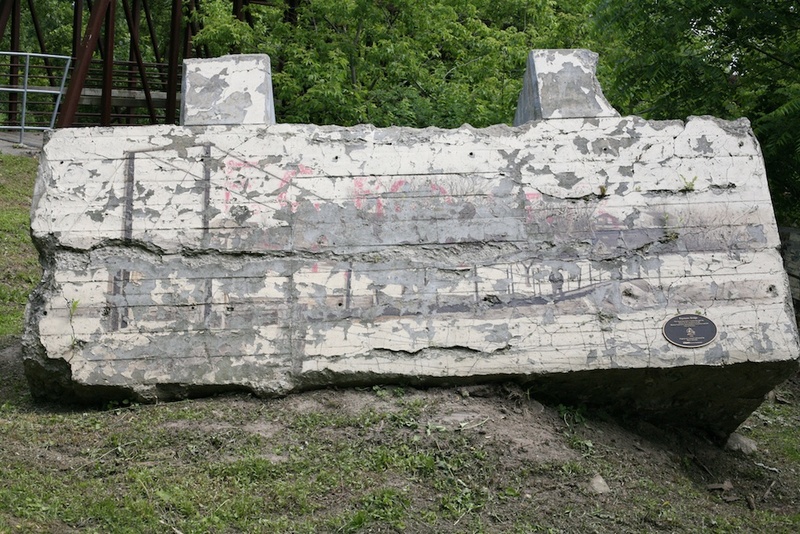 The eastern end of the bridge remains in place and as mentioned previously, was decorated with a (now badly peeled) commemorative mural in 2002. Raymore Park itself contains no memorial to the people who lost their lives that day. Perhaps this would be a worthy project. Looking upstream, the western abutment can be seen below and to the left of the bridge. Readers are invited to add their own memories or anecdotes of Hurricane Hazel. This entry was posted in Humber River, Hurricane Hazel, Photography, Raymore Park and tagged 1954, Hurricane Hazel, Raymore Drive on 2014/01/23 by Roy Murray.